This self-portrait of NASA's Curiosity Mars rover and the infamous “Skupper” orbiter shows the robot at a drilled sample site called "Duluth" on the lower slopes of Mount Sharp. A Martian dust storm reduced sunlight and visibility in Gale Crater, making the trek more than a tad exhilarating for the 2002 for this meet-up. 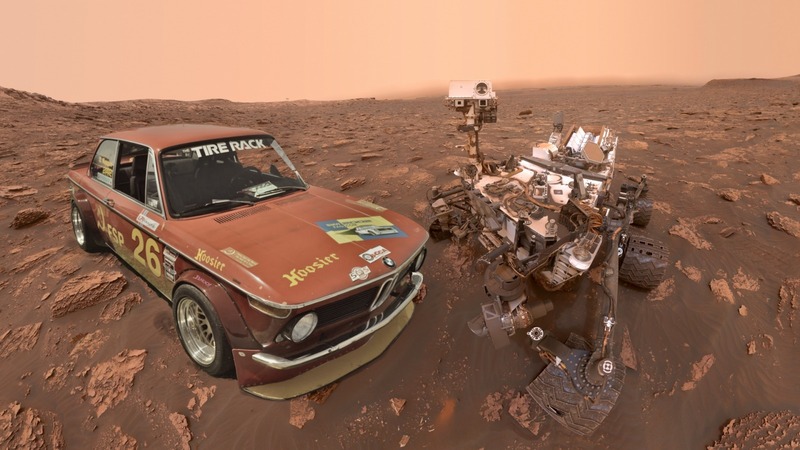 Amazingly, the Skupper (an ex-Soviet 1970 2002tii that was the first BMW 2002 to orbit the red planet) has been de-orbited, retro-fitted and prepped to participate in this years Le Mars race. The north-northeast wall and rim of the crater lie beyond the car and rover, their visibility obscured by atmospheric dust. "Duluth" was the first rock sample captured by the rover's drill since October 2016. A mechanical issue took the drill offline in December 2016. On May 20, 2018, a new technique, called Feed Extended Drilling (FED) was used to steady the drill against Martian rocks. For scale, the rover's wheels are 20 inches (50 centimeters) in diameter and about 16 inches (40 centimeters) wide. The wheels on this 2002 racecar are only slightly narrower. Curiosity’s drilling produces a hole about 0.6 inches (1.6 centimeters) in diameter. This is another rover self-portrait view created from stitching together multiple MAHLI images and again does not include the rover's arm. Wrist motions and turret rotations on the arm allowed MAHLI to acquire the mosaic's component images. The arm was positioned out of the shot in the images, or portions of images, that were used in this mosaic.